1. To make the bulgur, add the pomegranate juice, bulgur, cranberries and vanilla to a heavy 3- or 4-quart saucepan and bring to a boil, stirring once or twice. 2. Decrease the heat to maintain a simmer, cover and cook for 10 minutes. Stir in the blueberries and honey and continue to simmer until the berries are warmed through, about two minutes. 3. Gently stir in the zest and the orange blossom water. Taste and adjust with a bit more honey and orange blossom water if you like. 4. Add the Greek yogurt and the 1 tbsp honey to a small bowl and beat until smooth. 5. To finish, divide the bulgur between four bowls. 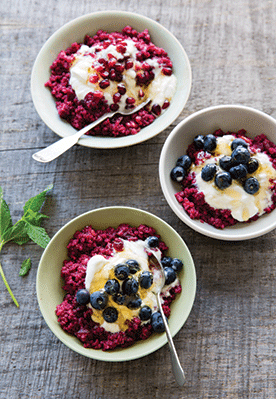 Top each with ¼ cup of yogurt and garnish with pomegranate seeds. Drizzle with more honey if you like. Serve warm. Note: For a gluten-free option, use quinoa, preferably red for a visual treat, instead of bulgur, and cook for 18 to 20 minutes. Variation: Use cranberry (instead of pomegranate) juice and 1 to 2 tbsp honey (instead of 1 tsp) for the bulgur and whole milk or part-skim ricotta (instead of Greek yogurt) to finish.